There are many ways to make your interior spaces look instantly new and vibrant even after years of use. However, the easiest way to breathe new life into a lived in space is by repainting the walls. A fresh coat of paint can instantly lift the mood of the space and the right color combination can make the room more personal and suitable for your lifestyle. Before you narrow down your paint choices to a pair or trio of colors, it is best if you think of the full range of shades. Think of the entire palette of colors that are available out there and see how they look when they are placed beside other shades. Likewise, you should think of the overall mood that you want to achieve for a specific space. If you want the room to feel lighter, choose cooler shades or pastel tones. If you want a moodier feel for the room, go for darker or more subdued palettes. If you want a space that exudes energy, then you should go for brighter and more vibrant colors. To get your house makeover started, listed below are a few of the most popular and foolproof color combinations for interior painting. Although a pale blue shade can seem overly sweet and childish on its own, it takes on a much more sophisticated look when it is combined with moodier shades of gray. This particular color palette is inspired by the appearance of a stormy sky and evokes a feeling of elegance and European flair. The cool hues create a soothing and cooling appearance that is easy and pleasing to the eyes. The pale blues and grays best complement furnishings that are in varying shades of gray, brown, taupe, and other neutral shades. This palette is a great alternative for homeowners who are not adventurous enough to take on a more vibrant colour palette. Nevertheless while the cream shade does offer a safe step away from a boring beige, the addition of the sunny yellows and golds bring in much needed warmth and liveliness into a room. Fortunately, the golden hues are toned down enough so that the overall feeling is that of happiness rather than of a blinding barrage of yellow. The creams and golden yellows best complement furniture and flooring in dark and rich shades. Red has always denoted power and aggressiveness. As such, it is a colour that should be used with great care and thoughtfulness. While you might think that a lighter shade might help to tone the red shades down, it could actually result in making it seem even more garish. In truth, when it comes to suing such a forceful color, the best course of action is to go toward the darker spectrum of colours and pair it with even darker complementary shades. The gradual gradation of colors results in a room that is dramatic but also relaxing since the gradation is more subdued. 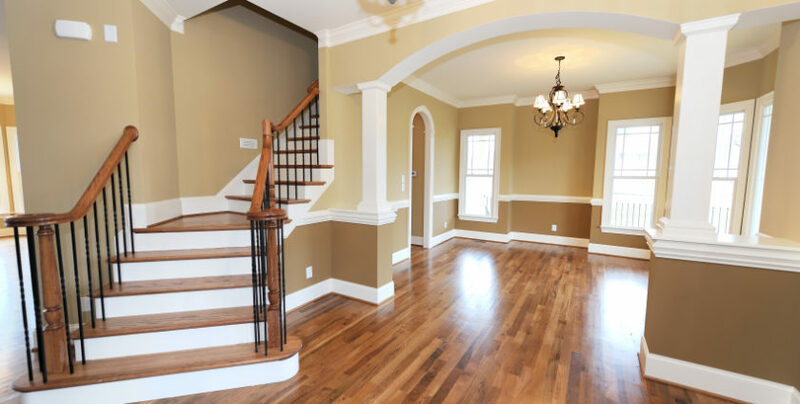 So when you decide to do the interior painting for your home, pay attention to these tips. This color pallet best complements clean and modern pieces that will not fight for attention in a room that already has such an eye-catching backdrop. As long as it is used properly, this powerful palette can create a dramatic and powerful effect that can serve as the focal point of your home.